Login failed! Please try again. 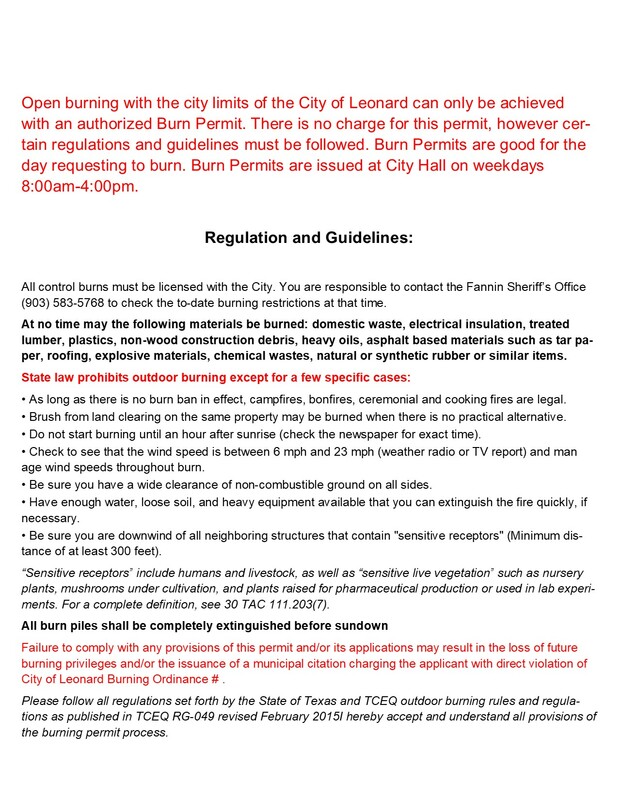 On April 17, 2019 the Texas Commission on Environmental Quality required the City of Leonard public water system, TX0740005, to issue a Boil Water Notice to inform customers, individuals, or employees that due to conditions which occurred recently in the public water system, the water from this public water system was required to be boiled prior to use for drinking water or human consumption purposes. The public water system has taken the necessary corrective actions to restore the quality of the water distributed by this public water system used for drinking water or human consumption purposes and has provided TCEQ with laboratory test results that indicate that the water no longer requires boiling prior to use as of April 17, 2019. If you have questions concerning this matter, you may contact William Bearden at the City’s twenty-four hour hot line (903) 819-5849. The notice is posted on the City Webpage, City Facebook page and on the City bulletin board located at 111 West Collin Street, Leonard, Fannin County, Texas 75452. Hard copies (English and Spanish) may be obtained from the City Hall office front counter during regular business hours. Once again, the City’s water system was not compromised (No bacteria or microbes were introduced into the water system). There was a brief drop in water pressure, requiring TCEQ notice. Please note, should the City ever experience a compromise in our water system, (bacteria or microbes introduced into the water system), the Public Works Department will immediately post such notice on every residence and business within our water system. El 17 de abril de 2019, la Comisión de Calidad Ambiental de Texas exigió al sistema público de agua de la Ciudad de Leonard, TX0740005, emitir un Aviso de hervir el agua para informar a los clientes, individuos o empleados que, debido a las condiciones que ocurrieron recientemente en el sistema público de agua, el el agua de este sistema público de agua debía hervirse antes de su uso con fines de agua potable o de consumo humano. El sistema público de agua ha tomado las medidas correctivas necesarias para restablecer la calidad del agua distribuida por este sistema público de agua utilizado para consumo humano o para consumo humano y ha proporcionado a TCEQ resultados de pruebas de laboratorio que indican que el agua ya no necesita hervir antes de utilizar a partir del 17 de abril de 2019. Si tiene preguntas sobre este asunto, puede comunicarse con William Bearden en la línea de emergencia de la Ciudad (903) 819-5849. El aviso se publica en la página web de la Ciudad, en la página de Facebook de la Ciudad y en el tablón de anuncios de la Ciudad ubicado en 111 West Collin Street, Leonard, Condado de Fannin, Texas 75452. Se pueden obtener copias impresas (en inglés y en español) en el mostrador de la oficina del Ayuntamiento. durante las horas regulares de oficina. Una vez más, el sistema de agua de la ciudad no se vio comprometido (no se introdujeron bacterias o microbios en el sistema de agua). Hubo una breve caída en la presión del agua, que requirió la notificación de TCEQ. Tenga en cuenta que si la Ciudad alguna vez experimenta un compromiso con nuestro sistema de agua (bacterias o microbios introducidos en el sistema de agua), el Departamento de Obras Públicas publicará inmediatamente dicha notificación en cada residencia y negocio dentro de nuestro sistema de agua. Click the link below to read the 2018-2019 amended adopted budget! Click the link below to read the Leonard Community Development Corporation Adopted 2018-2019 Budget! Click the link below to read the 2018-2019 adopted budget! Click the link below for the City of Leonard 2017 Audit. The City of Leonard strives to provide transparency to its citizens. We encourage you to browse this web site for financial reports, agendas and minutes of meetings as well as city services and other important information. 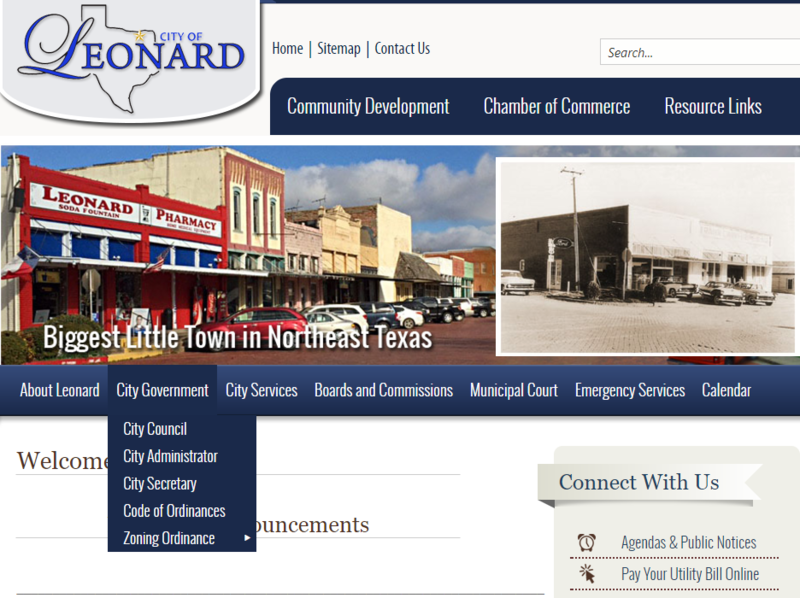 The City of Leonard Code of Ordinances are also now available. To access them, click the City Government tab, select Code of Ordinances from the drop-down menu. Copyright © City of Leonard, Texas 2016. All rights reserved.